I felt like Phileas Fogg returning to Canada this past week, as what would normally have been a 7 hr flight from England turned into a 50 hr shuffle through 4 countries, innumerable airport queues and even more security checks. We spent so long at Schiphol after KLM cancelled its flights that the words "Achtung Bitte" are seared into my brain and keep announcing themselves in a robotic female airport voice at unexpected moments. That said, I had a wonderful time away and so can hardly complain. 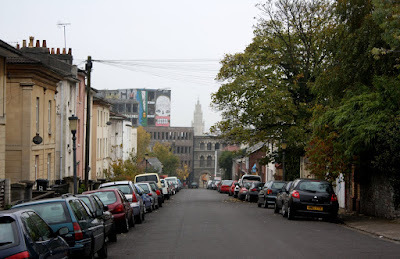 The main purpose of this trip was to see family (and indulge in those strangely exotic, quintessentially British jaffa cakes), but I was also able to go on a graffiti trek in Stokes Croft, do some intensive corset hunting in Bristol and Bath, and drift around Portishead listening to Portishead. Also visited a 13th century abbey (which, being a history nut, was exciting enough before learning that Alan Rickman had been filming there), danced around Bath's beautiful Assembly Rooms with a waltz on my iPod, and went to sing-along Mamma Mia at a tiny theatre in Devon. 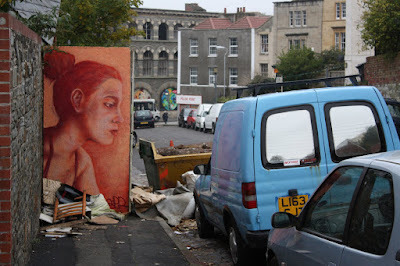 Here are some photos, beginning with Stokes Croft. A glimpse at Maggie Taylor's visions of Alice in Wonderland- it was difficult to take photos, so do check her website for more images. To and from the Bristol library. Roaming Bath, I noticed this red mannequin/sculpture, oddly positioned by a top window, sporting a matching red suit and sling. Later, I saw this little stone dog sitting alone near the top of a building. An adorable gargoyle- I wonder who commissioned him? A chandelier from the Octagon at the Assembly Rooms in Bath. The four doors spaced around the walls lead to the grand tea, card and ballrooms, as well as the Costume Museum. If you come early, the rooms are completely empty. With good music and a little imagination, it's easy to be transported back to the 18th century. The Costume Museum is downstairs. I was amazed by this court dress the first time I saw it on an earlier trip to Bath. The lady who wore it stood about as high as my waist and the panniers are so wide, I can't imagine her being able to move. French silk, 1760s. 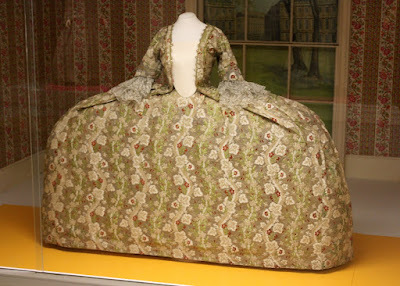 I was reading about Catherine the Great's coronation dress the other day, which is quite similar in appearance, but she was taller, so perhaps those panniers were easier to manage. Sack back dress from the 1760s made of blue brocaded silk. Evening dress from 1804. Muslin embroidered with glass beads. Day dress of purple striped taffeta. It consists of a separate bodice and skirt, common from the 1850s through the end of the Victorian period, as the sewing machine enabled people to make complex garments in component parts. The purple is still bright because the dress was coloured with chemical dye, invented in 1856. Silk evening dress from the 1880s. I wish it was a more dramatic colour, particularly with that neckline. I never understand peach. Corsets from the 1880s and 1890s. Mini in the medieval village of Lacock. The 1995 Pride and Prejudice was filmed here, which I didn't know until I was walking along a dirt shoulder on the "High Street" and realized I had watched Lizzy Bennet pass by an identical row of buildings. 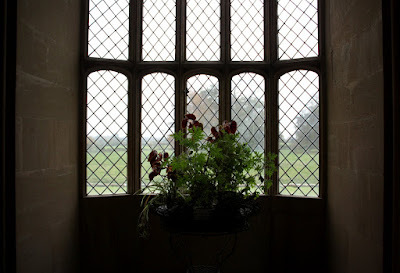 Lattice window where Henry Fox Talbot made the oldest surviving photographic negative (1835). Photography was strictly verboten elsewhere in the house, but he had an amazing collection of books, ranging in every possible subject, including one ancient looking volume simply titled "Bubbles", which I was very curious about. Posted by la femme at 8:41 p.m.
Adeleine, I love those red booties! !Any hints as to where they´re from? Your photos are such a wonderful journey, thanks a lot. Thanks for sharing so many amazing photos from your trip. Particularly love the blue brocade silk dress. I love the first picture and the historial clothes! amazing! those dresses and corsets are so fragile and beautiful. Glad to have you back - what wonderful photos - especially the first one of you! What a beautiful picture of you that is with the graffiti birds in the back. The blonde tone of your hair makes you look really scandinavian! I've totally missed your posts! Beautiful pictures Adeline, really I adore them. And I love your new hair, looks good on you! i am so inspired by the sidenote you wrote about travelling..'If you love travelling as much as I do, then you’ve just got to do it, and you have to find some way..'.. i wish i could just drop everything and travel! The graffiti of the girl in the purple boots is amazing. & love the costume museum shots--that neckline reinforces what I've always read about there only being inches of fabric to cover the bust. It's hard to picture until you see it. Yes, I was stunned by the crouching girl. It's big too- you can see it from a block away. What wonderful photos!! 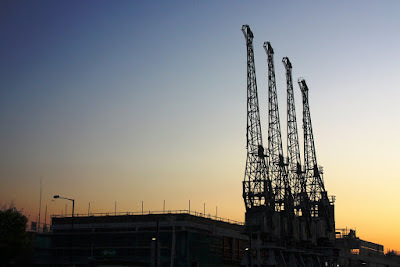 It makes me miss getting lost in the city, treasure hunting for public art and quirky photo opportunities! I have been in the US a year-- yikes! (though it was Alaska and wine country)-- but Dec 26th-- back to France and to the open road!! Adeleine! Please give us new inspiring posts!! BTW,I recently discovered this blog by a boy called Danny Roberts who makes beautiful fashion illustrations. Maybe you already know him... just in case u don´t, here´s the link: http://igorandandre.blogspot.com/. I think you´ll like it. gasp! you document your travels so well. i love taking these journeys with you. ..you always have a place to stay in phoenix! Awwww! You just made me so homesick for England! Such stunning gowns and corsets!! Languid play...chance frolements, euphemistic enchantment for "Achtung Bitte." Ooh- I love these pictures! Every time I see them my jealousy mounts. The purple dress is soo classic. It just beautiful. We don's it these days. Thanks for the great pictures. the street grafatti is really astounding. and i love a beautiful chandelier. happy holidays and happy new year la femme! That dress is amazing! I live in Bristol! 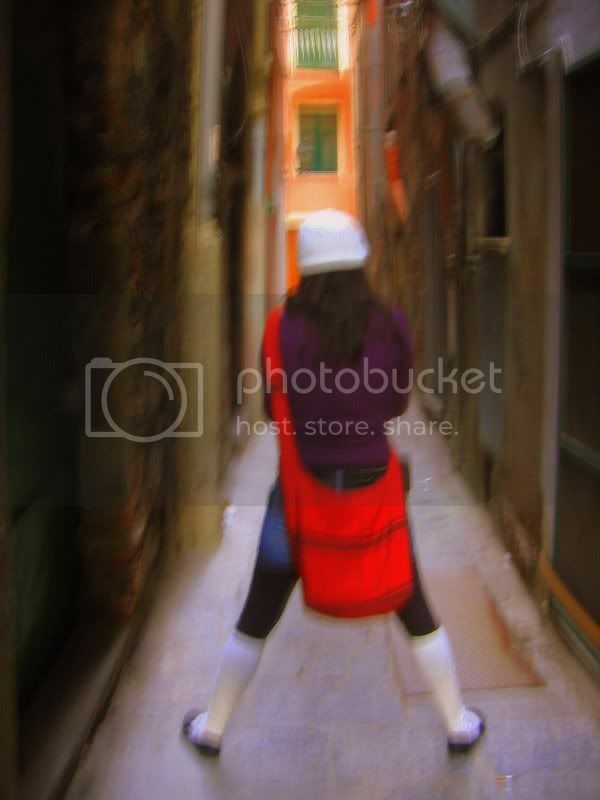 Heheee it's so interesting looking at it from a travelers point of view. Great pictures! wow what a gorgeous post! I enjoyed every single image, mesmerising! a la mode: lucky you! I've tagged your blog as "Blog I love"
I was wondering if you could add a link to my blog on your list of 'model citizens'. It would be really nice from you, also because I saw there's nor nothing about Barcelona. Thank you so much and hope to hear more and soon from you! Fantastic pictures of all this graffiti and street art. Thank you some much for sharing it! No worries. I'm happy you like it. Those red boots are really lovely! I'll definitely check them out! welcome to bath! the Assembly Rooms are the best, hope you loved it! The Costume Museum is candy for the eyes. Some of the best street art i've seen in a while. These photos make me slightly proud to be British, I have to say! Good shots of Banksy's work especially. It's funny, I live in Bath and yet look at it through completely different eyes. Thanks for opening my eyes a bit more. your pictures are amazing. i love the murals!!! Stokes Croft is in Bristol. I'm a big fan of your blog and the Alice in Wonderland photos, I'd love to exchange blog links with you. oh, a my dear! i love these photos, they make me miss england too too much. i miss your posts...hope you are well, wherever you are, dear waldo. i love your blog; your photo make me happy !!!! jadoore! Really very nice place, Keep it up! what beautiful pictures...the graffiti is amazing! I like very much the historial clothes in this pictures! Beautiful coronation outfit! that' why french doors were invented! I love this post. It took me back to my Pride and Prejudice Days. I've always loved the empire waist line! I love almost all the attire. I can see why that is your dream storage system, it's beautiful! Wow, all of these photos are amazing. I've always loved graffiti art and enjoy looking at photos of them. It just amazes me every time I see an gigantic mural and the effort and artwork that's put into each one. Argh, I am so pissed the people I was with in Bath didn't want to go to the Costume Museum. Thanks for taking pictures so I can see what I missed!